As I type this post today, my future mother-in-law sits at home, despondent. Last weekend her arch nemesis won state elections in West Bengal. It’s a historic moment. Mamata Banerjee, the founder and leader of West Bengal’s Trinamool Congress Party, defeated the incumbent Communist Party of India-Marxist (C.P.M. ), the longest running, democratically elected communist government in the world. For West Bengal, this is no less than a revolution, and supporters, who affectionately refer to Mamata as Didi, or ‘aunty,’ have high hopes that after 34 years, the Trinamool Congress Party will be victorious. Mamata promised to clean up corruption in government, ignite revenue for state projects and encourage industry development — all this while championing a populist stance in favor of farmers and workers. That sounds rather communist, you say? Welcome to West Bengal politics, where communists are capitalists. To be fair, the party meant well in the beginning. In the early 20th century, the independence movement against British colonialism was a natural crucible for class struggle. 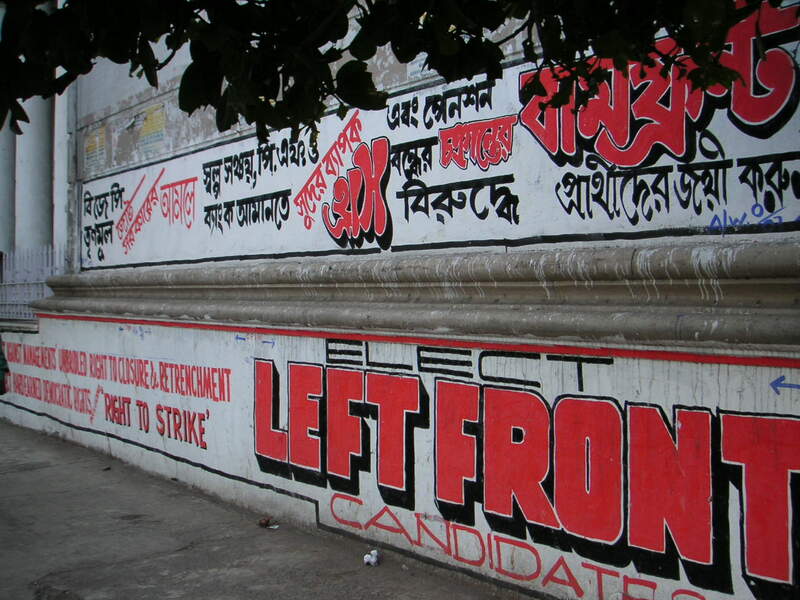 The communist party first arose in Calcutta as the unwelcomed, armed child of that larger movement. The party was small and disorganized then. Interestingly enough, the CPI took off after independence. Nehru, India’s first Prime Minister, developed close ties with the Soviet Union and, counter-intuitively, the Soviets pressured India’s Communist Party to support the elected Congress government. Some obliged; others believed that India was still largely a feudal society. They broke away still calling for class struggle. Thus was born the offshoot, CPI – Marxist. There are few if any examples of Communism that have successfully survived the drive of capitalism. West Bengal was no different. With each decade, compromises for industry crept in. The party made its decisive shift in the 1990s when it supported the reacquisition of land from independent farmers for industry development. That decision combined with an increasing failure to improve the economy and state infrastructure, and leniency towards corruption. The end was nigh. Who knew it would last another 20 years? Bengalis are perhaps the sincerest voters you’ll find. The twin needs for democracy and revolution course through their veins. Americans hold rallies that get a little loud, but Kolkatans bathe their city in politics– literally. Campaign graffiti creeps everywhere, almost like a fungus. It devours every public wall. And parties employ some excellent artists. Communist and Trinamool flags hang alternately across narrow residential streets, obscured only perhaps by the slightly larger Indian flags that welcome the soccer season. Rallies don’t hide out in sterile conference halls. 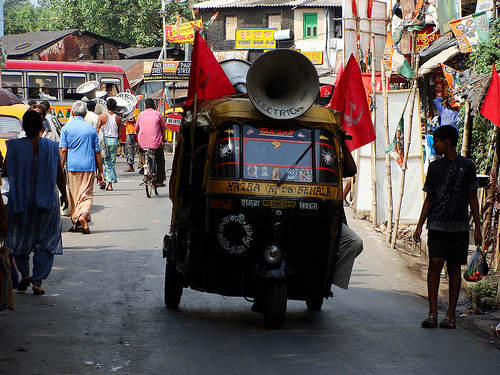 They take to the streets with beat-up lorries topped by rotating loudspeakers. The most ardent supporters paint themselves in party colors and dance. It’s carnivale, a little like the Indian religious festival of Holi, and I half expect to step out of our house to receive a bright ball of communist red or Trinamool green cotton candy. 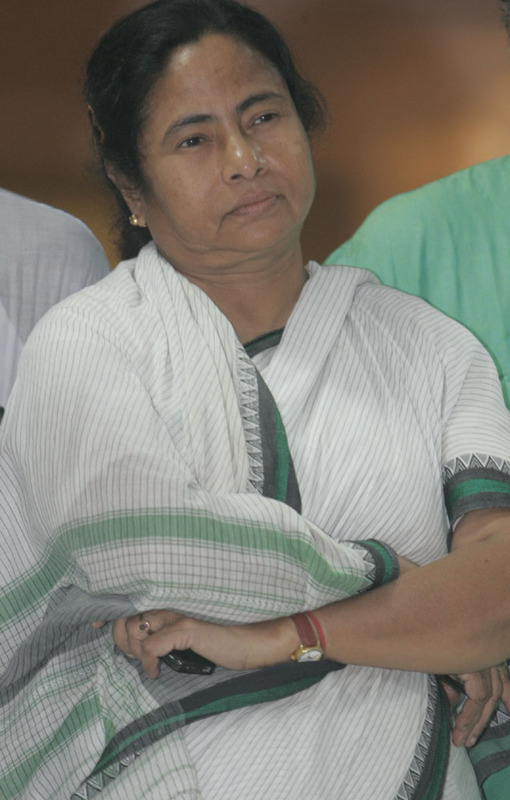 So far, Mamata has made a lot of promises. Industrial parks, petrochemical hubs, thousands of jobs, irrigation facilities, and multi-specialty hospitals across the state. The promises are, well, popular. The trouble is that these same promises were gifted by her rivals as well, and Ms. Banerjee has yet to explain just how she manages to fix health and education, improve infrastructure and still bring in revenue. Can she woo industry and honor promises to poor farmers and workers? Other than reminding her constituents, “I am not God,” she is reticent in delivering details.